Unlock the new mind-blowing feature on your iPhone, iPod and iPad: Turn it into a real Air Blower! Blower uses secret hardware features of your iOS device, check below for the blowing power of your specific model. • Knocked Ellen Degeneres right out of her chair during her TV talkshow! • Touch the blower rotor: drive it yourself and see the sparks! Curious? 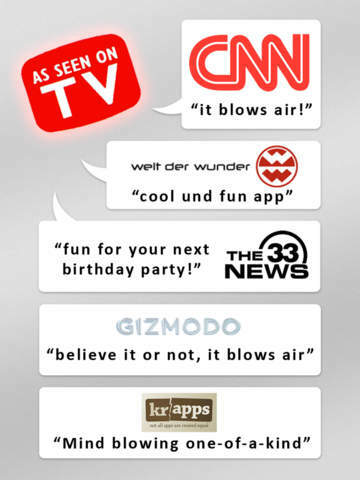 Watch the blower in action on BlowerApp.com, or search for "iPhone blower" on YouTube, you will find 40+ movies of users all around the world. For maximum blowing power, remove protective covers/casings that could block the air flow, and ensure no dust has accumulated in your speaker opening. You can verify the cool air flow by holding the speaker opening close to your mouth. When blowing out candles, don't burn your device! Your mobile device must have at least 96.03 MB of space to download and install Blower app. Blower on sale for only $0.99! Download it from iTunes now to save money. Hurry in for the deals, they are updated daily. If you have any problems with installation or in-app purchase, found bugs, questions, comments about this application, you can visit the official website of Qneo at http://www.blowerapp.com. • BEAT mode: let candle & lighter flames dance to the music! • AIRGUN mode: let flames shiver under gunfire! • and… MORE blowing power on all devices!